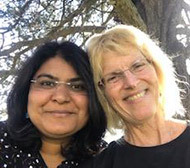 Seema Agarwal is a healer and a mystic, certified in various healing modalities like Systems and Fammily Constelations (ancestral healing), Energy healing, and EFT (1-3). She bring all these different streams of wisdom traditions into her workshops and private healing sessions. Starr Potts has been a change agent and supporting personal and community growth for 35+ years as a therapist, shamanic practitioner and facilitator. She loves the wisdom that merges with them in between us.